So you’re getting a new puppy or rescue dog, and you want to choose a name for him that starts with Z. In this article, we’ll look at some great dog names that start with Z. Even though Z is the last letter of the alphabet and you might think there aren’t many names to choose from, we’ve found plenty! So dive right in and see if you can find the perfect dog name beginning with Z for your perfect pup! Whether you want a cute name, a cool name, or a funny name for your pup, whatever moniker you choose, it must be one that your dog can remember easily. For that reason, always pick a short name, rather than a long, complicated one. For a start, a long name will be difficult for your dog to learn. Secondly, you must imagine yourself calling the name in a crowded dog park or on a windy beach. Will your pup be able to hear the name clearly? Often, dog names that have only one syllable are the best choice. Dogs hear our words, and they listen to how we say them too. It’s thought that a name with a hard consonant sound and a very distinctive vowel sound will make the word easier for your dog to memorize. For example, Zeke would be a good choice; it’s short, snappy, and the sound is clear. However, if you find a longer dog name that starts with Z that you really like, you can still have it. All you need to do is shorten the name to a nickname that your puppy will be able to learn easily. As well as our article archives, another really useful source of suggestions for dog names is a baby name book. Books like this one include hundreds of names that start with Z, many of which could be the perfect fit for your new four-legged friend. These books also include the meaning of each name too, so you can find one that’s just right for your dog’s personality and looks! There are a few popular dog names that start with Z. If you’re looking forward to welcoming a female dog into your home, you’ll be looking for a suitable female dog name that starts with Z, or even a unisex name that can be used for a boy dog too! The name you decide on will largely depend on the breed of dog and her character. Therefore, a mini pup such as a Jack Russell Terrier might suit a pretty, dainty name. However, if your new arrival is a Saint Bernard, you’ll need something altogether stronger. Have a look over this article for some more ideas for female dog names that start with Z. You never know, you might just find exactly what you’re looking for here! If your new dog is a boy, don’t worry, there are lots of dog names that start with Z for you to choose from! Remember to pick a name that suits your dog’s look and his personality too, although that can be guesswork if you’re buying a puppy! Many of the names we’ve included in this part of our guide would suit a male or a female dog. So if you see something you love, go for it! Have a look at this article for a few additional ideas! If your dog is totally cool, he or she will need a cool dog name that starts with Z! The article at this link includes hundreds of cool dog names, and many of them start with Z. Of course, many dogs are just plain cute! And if your new four-legged friend is a total cutie pie, you’ll need a cute name to suit him or her. Need some more ideas for cute dog names that start with Z? At this link, you’ll find a whole lot of cute dog names that might look good on your cutie pie pup! 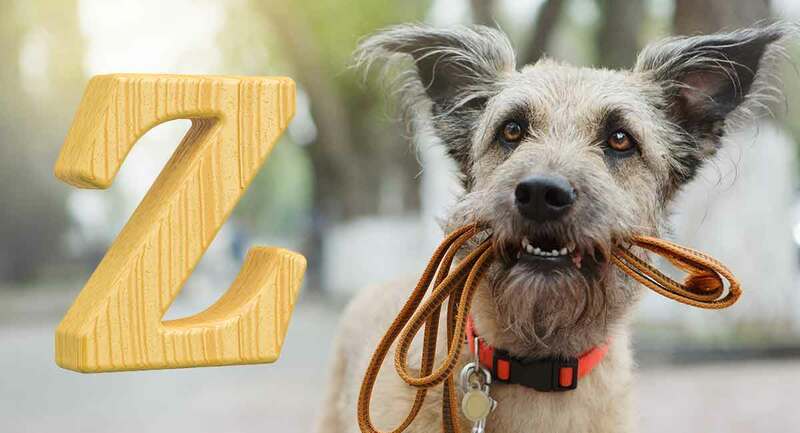 If you have a keen sense of humor or if your dog has amusing habits, you might want to pick a funny dog name beginning with Z. But if you do choose a funny name for your dog, be sure to select something that won’t offend other people nearby. Also, remember that a joke that’s relevant now or perhaps relates to a celebrity who is in the news today may not be remembered in a few years. Although, if you love the name, that may not be a problem for you. The inspiration for funny dog names can come from comedians, historical figures, or even amusing cartoon or TV characters that you particularly like. Every puppy is unique, and every unique dog deserves a unique name too! A unique dog name that starts with Z means that there will never be confusion at the vet clinic or in the dog park. And your treasured pup will never have to share his name with another! Check out this article for some more unique dog name suggestions. If you have chosen a dog breed that looks tough, you might want to pick a suitably tough name that starts with Z.
Click this link to see an article that’s packed with tough dog names for you to ponder on. Here are a few fun facts about dog names that start with Z that you can use to impress your friends! Do you know the most popular dog name that starts with Z? The takeaway here is don’t pick this name if you want your dog to stand out from the crowd! The Kennel Club does not recognize any dog breeds that start with Z. The only dog breed that has a name starting with Z is the Zuchon, a crossbreed. The Zuchon, or Shichon as these pups are also known, is a cross between a Shih Tzu and a Bichon Frise. If you plan on getting one of these pretty little furbabies, why not call him or her, Zuchon? That’s a cool and unique dog name starting with Z that’s totally suitable! Did you know that there are hundreds of minor planets with names that start with Z? Check out the following for a few more interstellar dog names that start with Z! We reckon that any one of these names would be absolutely out of this world! What name did you choose for your new friend? We’d love to know, especially if it’s one of the dog names that start with Z that we’ve suggested in one of our articles. Share your new furry friend’s story in the comments section below with other readers and us!